During Nintendo’s E3 Direct, the Metroid villain Ridley was officially confirmed for Super Smash Bros. Ultimate. Ridley uses his raw power to beat his enemies into the ground, or uses his tail in a beautifully purple sweeping attack. 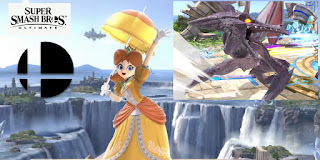 Requested time and time again by Smash fans, Ridley’s attacks can cause massive amounts of damage depending on the angle you hit your enemy. He’s also able to breathe fire, of course, with his Final Smash allowing him to blast a fellow character into space, pin them against Samus’ ship and obliterate them with a fiery explosive attack. Also announced for Super Smash Bros. Ultimate is Daisy! She will be an Echo fighter for Princess Peach. That basically means she’ll have the similar moves as Peach. Super Smash Bros. Ultimate releases on December 7 for Nintendo Switch.